Dialogue and communication have today become central concepts in con- temporary man's effort to analyze and comprehend the major roots of con- flict that threaten our twentieth-century world. Underlying all attempts at dialogue, however, is the presupposition that it is ontologically possible for men to reach one another and to communicate meaningfully. It is to this most basic question - of the possibility and the limits of interpersonal rela- tionships - that various phenomenologies of intersubjectivity direct them- selves. Both the topic (intersubjectivity) and the method (phenomenology) are relative newcomers to philosophy and in a sense they arrived together. Ever since Descartes, philosophers have labored to explain how a subject knows an object. But not until the twentieth century did they begin to ask the much more fundamental and vastly more mysterious question - how does one subject encounter another subject precisely as another subject? 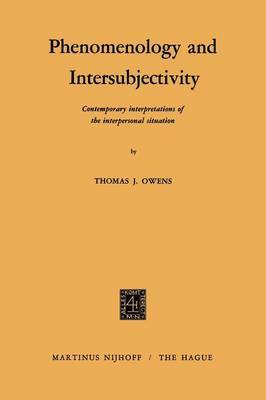 The problem of intersubjectivity is thus one that belongs in a quite special way to contemporary philosophy. "Classical philosophy used to leave it strangely alone," says Emmanuel Mounier. "If you ennumerate the major problems dealt with by classical philosophy, you have knowledge, the out- side world, myself, the soul and the body, the mind, God, and the future life - the problem created by association with other people never assumes 1 in classical philosophy the same importance as the other problems. " Phenomenology, too, is a newcomer to the philosophical scene, especially in America.